The deer mouse (Peromyscus maniculatus) is one of the most familiar rodents found in North America. The deer mouse is about the size of a common house mouse. Their color ranges from pale gray to deep reddish brown. The tail is always sharply bicolored; it is white below and dark above. They have large beady eyes and large ears giving them good sight and hearing. This species is very adaptable and inhabits nearly every dry-land habitat within its range. They can be found in forests, grasslands, brushlands, agricultural fields and deserts. Avoids humans if indoors, preferring attics, basements or crawl spaces. 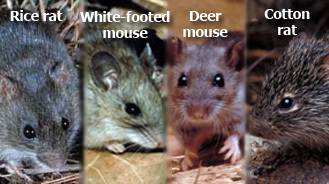 Deer mice can be found active on top of snow or beneath logs during the winter. The Not-So-Innocent Deer Mouse Could Be Deadly! Deere Mouse – The mice and rats that carry hantavirus don’t get sick from it. They only serve as vectors, carrying it and passing it on to people. Deer mice may appear cute and harmless, but despite their cute little whiskers and fuzzy little bodies, the deer mouse can be extremely deadly. Deer mice are the major carrier of a hantavirus that causes hantavirus pulmonary syndrome in humans. Hantavirus Pulmonary Syndrome is transmitted when urine and feces are disturbed. Extreme care should be used when disposing of deer mouse droppings. The droppings, saliva and urine of certain rodent species are known to transmit Hantavirus pulmonary syndrome (HPS). Disturbance of the droppings causes the virus to go airborne in a process known as aerosolization. ( Aerosolization is when tiny particles of a disease-causing organism become airborne and can cause disease in those who breathe them in. Hantavirus and tuberculosis are spread this way). The deer mouse is the major carrier of a hantavirus that causes hantavirus pulmonary syndrome in humans. Although transmission is rare, HPS can prove deadly if left untreated. Symptoms include tachycardia and tachypnoea. Cardiovascular shock may occur in severe cases. Rodent control is still considered the most effective prevention of HPS. Contact Minnesota Wild Animal Management Expert to discuss extermination options. Remember that not all types of rodents carry Hantavirus. Neither common house mice nor common rats have been associated with HPS in humans, for example. Yet because it can be tough to tell just what kind of rodents you have, play it safe — clean up the infestation and rodent-proof your home or workplace. Only some kinds of mice and rodents can give people Hantaviruses that cause HPS. In the United States, they are the deer mouse, the white-footed mouse, the rice rat, and the cotton rat. However, not every deer mouse, white-footed mouse, rice rat, or cotton rat carries a Hantavirus. Other rodents, such as house mice, roof rats, and Norway rats, have never been known to give people HPS. Since it is hard to tell if a mouse or a rat carries a Hantavirus, it is best to avoid all wild mice and rodents and to safely clean up any rodent urine, droppings, or nests in your home. Dogs and cats cannot give people Hantavirus infections. Rodent droppings of any kind should be handled with utmost care. Particularly after they have dried, feces can be reservoirs of a variety of dangerous diseases and viruses. These dry droppings break apart upon contact and release airborne particles that may enter your nasal passages, causing infection. Do not handle droppings in your home without first taking preventive measures. Tightly fitted face-masks and rubber gloves are highly advisable. Avoid sweeping or vacuuming the location, as this may lead to further release and dispersal of virus particles. Proper removal of any animal droppings, along with sanitation is absolutely necessary. This brochure provides detailed information for prevention of hantavirus in and around your home.